I am a product of a Broken Family. My mom, Melita died at the age of 52, and my father, Jose Jr. at the age of 47 due to excessive use of PROHIBITED DRUGS. As a young struggling kid, I never had the chance to be with them like anyone did with their parents. Moreover, before they left, I never forgave them and even forsake them for letting us (me and my brother) suffer the crunches of life without any one to be with. Not until such time during my older years, I realized that I should have given them their chance to prove their love towards us. A very sad fact that I have to deal and bear in mind in this lifetime journey of mine. The same reason why it has been my ADVOCACY that if I shall be given the blessing to redeem myself to my Mom and Dad and involve individuals (such as my beloved club RCMW) who share the same vision in giving the Drug Dependents nowadays a chance to recover and even be a part of a functioning community once more, and with the loving care of their families, I will put all the efforts in my capacity to make sure that this be a reality and put into action. At RCMW we say; we shall not walk alone in the dark, we will never give up without a fight, we will not falter nor will not be moved by anything on earth to see this project through as long as we live…. For the past few years or more, DRUGS and SUBSTANCE ABUSE has been a problem and a continuous challenge for the Government, Society and the families of the people who are hooked in such a dangerous practice (Drug Dependency/Addiction). Until now, these practice continues to destroy families and lives of thousands and without any help, even in small ways, this could hamper not only economic growth but destroy homes and lives of some of our countrymen. It is in this light that, even before the start of the Very Inspiring Year, Officers and Members of RC Marikna West, in its desire to help advance the move of our Government against Illegal Drugs and Substance Abuse, launched the “ Kardo : Maging Inspirasyon Ka Na!” program. It is the Desire of the General Membership of the Club not just to help in the eradication of DRUGS but to REFORM Drug Abuse Inmates and also help them RETAIN their value in their family and the Community wherein they previously belong (before addiction). We believe (in our opinion) that problems arising from such cannot just be solved by EXTRA JUDICIAL KILLINGS and IMPRISONMENT but on the REFORMATION of the Violators most specially the ones’ who already served their sentence in Jails. On May 4, 2018, The Supreme Court issued under OCA Circular No. 90-2018 a Resolution dated 10 April 2018 of the Court En Banc in Administrative Matter No. 18-03-16-SC (Adoption of the Plea Bargaining Framework in Drugs Cases). Considered as a blessing in disguise, this paved the way for us (Golden Westerners) to look for ways on how to tap the Judiciary as a partner in this momentous project. Thus , as early as June of this year, The Very Inspiring Team, lead by yours truly, President Jojo “Pogi” Cruz III formed a Committee headed by Past President Frank Levi Ugsad and Past President Serafin “Bojie” Bernardino to expedite on how we can start the ball rolling. On June 7, 2018, we had the first meeting with the Judges Association of the Philippines led by Hon. Judge Felix Reyes and put into action all the plans we first dreamed of. A target of more or less 300 Drug Related Inmates from different Courts was presented and eyed for the program. 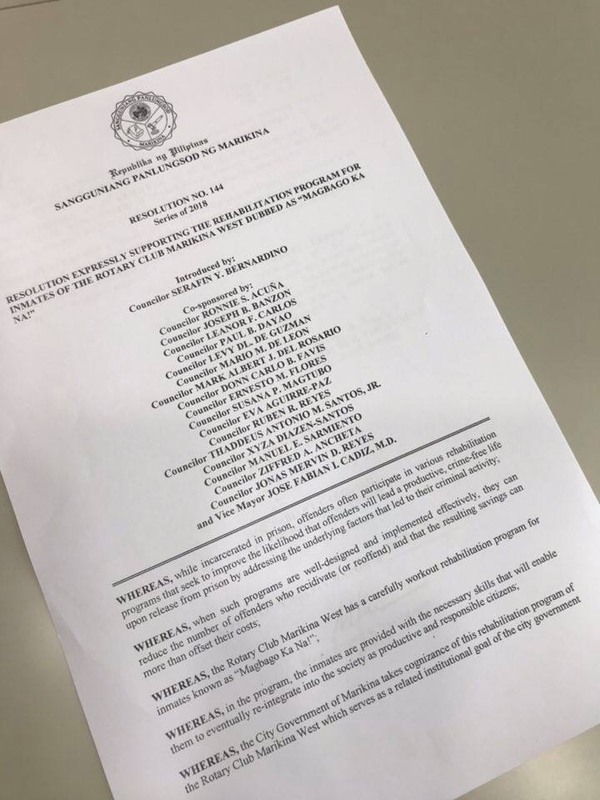 On top of this, the leadership of the Club has formally asked the help of Past President Bojie Bernardino, a Marikina City Councilor to facilitate the passing/approval of some Resolutions in the City to formalize the tie-ups and coordination between all governing agencies that may be of a helping hand in the realization of the project such as the Marikina Anti-Drug Abuse Council (MADAC), the City Department of Health, Mayor’s Office, the City Peace and Order Committee, Philippine National Red Cross (Marikina Chapter) and topped with a Resolution by the People of Marikina expressly supporting this momentous program. 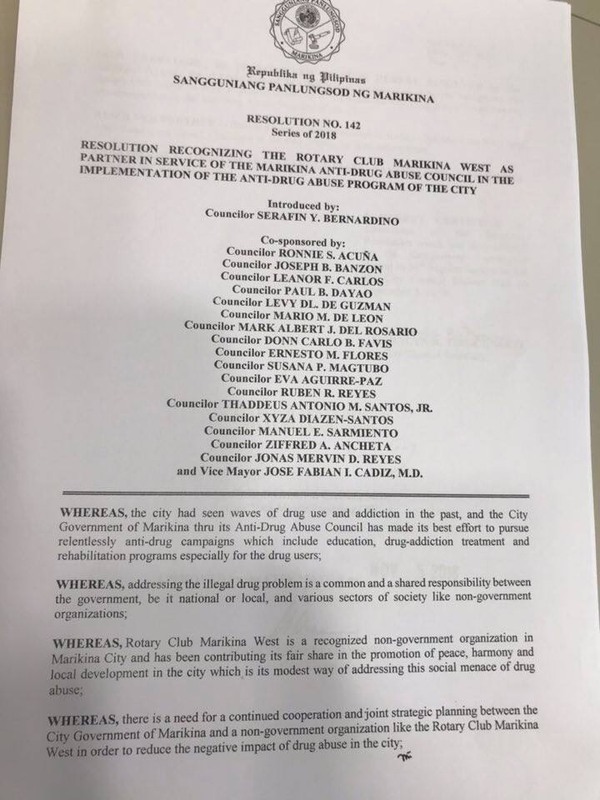 RESOLUTION RECOGNIZING THE ROTARY CLUB OF MARIKINA WEST AS A PARTNER IN SERVICE OF THE MARIKINA ANTI DRUG ABUSE COUNCIL IN THE IMPLEMENTATION OF THE ANTI DRUG ABUSE PROGRAM OF THE CITY. 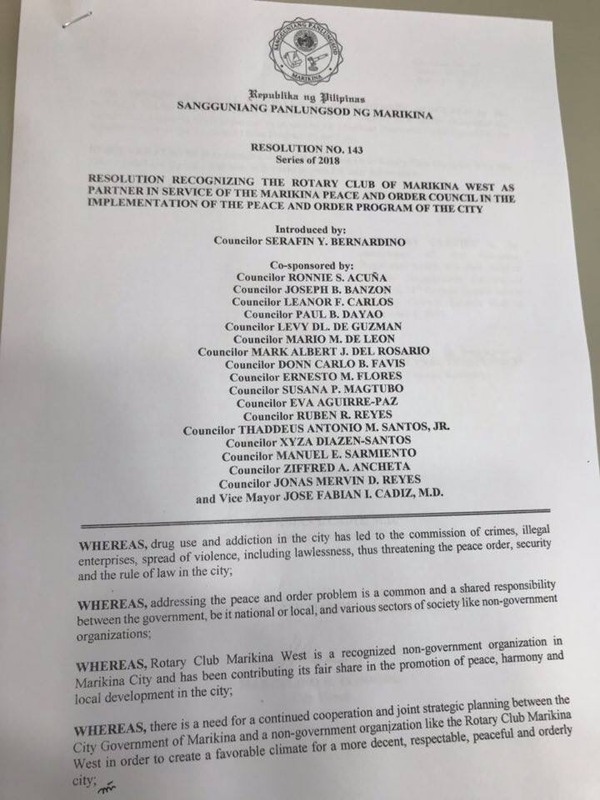 A RESOLUTION RECOGNIZING THE ROTARY CLUB OF MARIKINA WEST AS A PARTNER IN SERVICE OF THE MARIKINA PEACE AND ORDER COUNCIL IN THE IMPLEMENTATION OF THE PEACE AND ORDER PROGRAM OF THE CITY. RESOLUTION EXPRESSLY SUPPORTING THE REHABILITATION PROGRAM FOR THE INMATES OF THE ROTARY CLUB OF MARIKINA WEST DUBED AS “ MAGBAGO KA NA”. 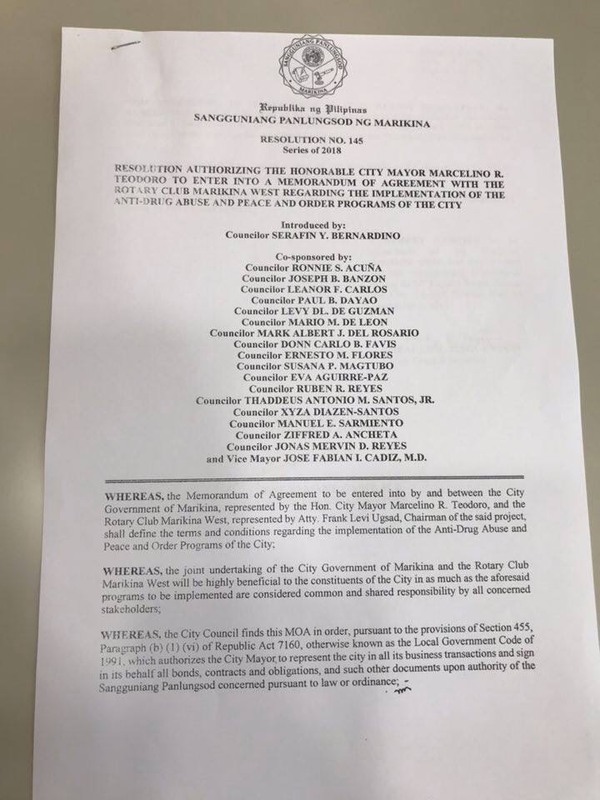 RESOLUTION AUTHORIZING THE CITY MAYOR MARCELINO R. TEODORO TO ENTER INTO A MEMORAMDUM OF AGREEMENT WITH THE ROTARY CLUB OF MARIKINA WEST REGARDING THE IMPLEMENTATION OF THE ANTI DRUG ABUSE AND PEACE AND ORDER PROGRAMS OF THE CITY. All Passed Resolutions is a Milestone considering the speed of the Passage of such needed support for the PROGRAM. Arrangement of other activities that shall enhance the success rate of their REJOINING mainstream society. This project in its entirety also aims to help our brothers and sisters regain their momentum in being a productive part of their community once more. During the early part of this Rotary Year, RCMW officers met with different Organizations such as the Philippine Volunteer Against Illegal Drugs, Philippine Drug Enforcement Agency (PDEA), Department of Health, Marikina Anti-Drug Abuse Council, Judges Association of the Philippines, Bureau of Jail Management and Penology (BJMP), City Council, Office of the Vice Mayor of Marikina, Office of the Mayor of Marikina and most specially the Parents and relatives of the inmates to be graced by the Program all in anticipation of the much needed knowledge for the realization of the Project. The Marikina Judiciary has scheduled November 19, 2018, “Judgment Day”, for the conduct of simultaneous hearings and the Promulgation of the release. It is also on this day that the Rotary Club of Marikina West shall, together with its Service partners in this program, brief and Direct all freed Inmates on the details, locations and time of their Rehabilitation (in some cases), Community Service, Reformation Programs, and other requisites in accordance with their release. As of December 17, 2018 we have already facilitated the release of more than 300 Drug inmates and the application for Drug Dependency examinations is now reaching almost 500. We are also on the 4th week of our Reformation Program to those Inmates who were already released. Done simultaneously in different Barangays and at the Marikina Anti Drug Abuse Council office facilitated by the Rotary Club of Marikina West. Alongside with it, we have conducted a RANDOM Drug Test for 60 Kardo Participants who were released and NONE of them was found positive. Thus, making this program effective in its initial stage of the Reformation Process. However, we still have a lot of time to BURN for our Beloved Brothers and Sisters for the glory of their families and our Dear God as well. Throughout the current Rotary Year and to extend to the next Rotary Year(s) as the facts and circumstances would warrant. Project end date is currently undetermined. A progress report, not a final report as this is envisioned to be a continuing project, covering the initial cut off date of January 31, 2019 will be submitted to the District by February 14, 2019. Initial Cost of Php 150,000.00 is arranged from the Club Funds of RC Marikina West and other sources to cover Administrative and out-of-pocket expenses; the initial funding could be replenished depending upon its sustainability. Aside from the initial detainees who have undergone DDE and who are covered by the November 19, simultaneous hearings, there are many more left in the Detention Cells who may also qualify for a Plea Bargain. RC Marikina West will sustain and extend its humanitarian services also to them. The template borne from this experience may also be replicated in other jail locations by other Clubs and other Civic Non Government Organizations. Thus, making this a truly Significant Project.